The speed with which a learning algorithm converges as it is presented with more data is a central problem in machine learning --- a fast rate of convergence means less data is needed for the same level of performance. The pursuit of fast rates in online and statistical learning has led to the discovery of many conditions in learning theory under which fast learning is possible. We show that most of these conditions are special cases of a single, unifying condition, that comes in two forms: the central condition for `proper' learning algorithms that always output a hypothesis in the given model, and stochastic mixability for online algorithms that may make predictions outside of the model. We show that under surprisingly weak assumptions both conditions are, in a certain sense, equivalent. The central condition has a re-interpretation in terms of convexity of a set of pseudoprobabilities, linking it to density estimation under misspecification. For bounded losses, we show how the central condition enables a direct proof of fast rates and we prove its equivalence to the Bernstein condition, itself a generalization of the Tsybakov margin condition, both of which have played a central role in obtaining fast rates in statistical learning. Yet, while the Bernstein condition is two-sided, the central condition is one-sided, making it more suitable to deal with unbounded losses. In its stochastic mixability form, our condition generalizes both a stochastic exp-concavity condition identified by Juditsky, Rigollet and Tsybakov and Vovk's notion of mixability. Our unifying conditions thus provide a substantial step towards a characterization of fast rates in statistical learning, similar to how classical mixability characterizes constant regret in the sequential prediction with expert advice setting. van Erven, T.A.L, Grünwald, P.D, Mehta, N.A, Reid, M.D, & Williamson, R.C. (2015). 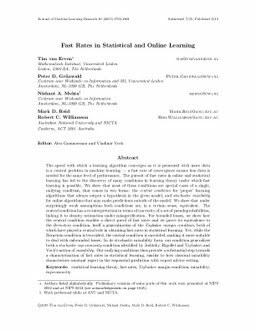 Fast Rates in Statistical and Online Learning. Journal of Machine Learning Research.